Now that my ADO.NET Data Services support has been merged into the trunk of NHibernate.LINQ, I do have some caveats about using NHibernate.LINQ with ADO.NET Data Services. ADO.NET Data Services is a beta 1 product so there are some bugs and issues that you will either need to avoid or work around. First it looks for attributes that describe the 'primary key'. Failing that, it looks for properties on the entity called ID, or ending with "ID". If this is your scenario, I might suggest waiting for later build of ADO.NET Data Services to be released as this is definitely a bug not expected behavior and I have gotten word from Microsoft that it is fixed in the RTM (which isn't available yet). With these changes, ADO.NET Data Services work fine. From a technological perspective, I think this is awesome. However, there are architectural issues with exposing your model in such a fashion. Specifically, with regards to availability and scalability on the operations side, and schema versioning and adaptability on the development side. I think he's right in that there is a schema version issue here that needs to be addressed but that the availability and scalability problems are ones that would be in the underlying data model itself. Since ADO.NET Data Services are just a convenience around WCF's REST Service Model, we can scale out or up depending on our needs (as well as caching). What I think is important is to understand the reason behind ADO.NET Data Services. It is not a model to replace typical Web Service or Message Bus architectures. Its not all that fast or efficient. 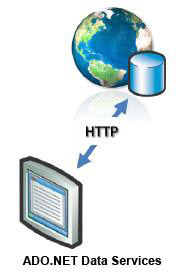 Its purpose is to allow the creation of a simple model to allow communication across the firewall. What I mean is that it is meant for the AJAX and RIA developers. Its a way of communicating data to clients that run on the Internet.